This is a double dose of friend rock for me - both bands feature dudes I've known for nearly two decades now (it makes me feel really old to say that). Don't hold that against them though - this is still a damn fine pair of catchy songs worth lending your ear to. 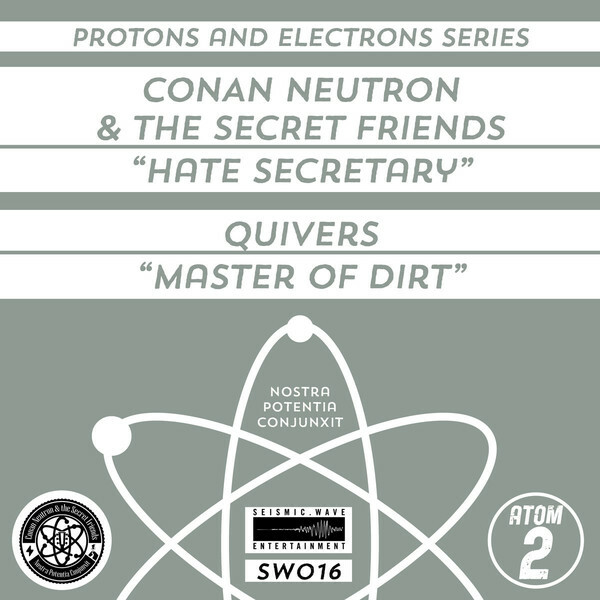 This is actually the second entry in series (out of four so far) where Conan Neutron & The Secret Friends release a split seven inch with them on the a-side and a different band on the flip. Their track "Hate Secretary"is guitar rock, very catchy and melodic. A lot of what Conan did in the past (specifically Replicator) would get compared to Shellac, but this material is closer to Foo Fighters-esque heavy alternative than anything to which Steve Albini would lend an aluminum guitar. It's very sing-along-able. That's a word right? 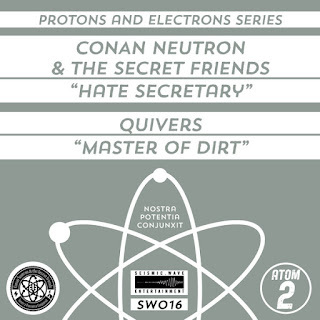 The b-side "Master Of Dirt" is from Quivers, a San Francisco band full of dudes from other bands - most notably a couple of cats from Charmless, and my pal Colin from Ex-Boyfriends (and a bunch of other bands). To no surprise if you've listened to any of those groups this is very Superchunk influenced, and I'm not just saying that because I know Colin loves them almost as much as I do. Colin has always had an ear for hooks. Both of these songs would fit in great on any indie rock comp from the mid-to-late nineties. Given these guys are basically as old as me or not far off, that's not really surprising.